If you are following along, this is the third post in a series about our trip to the beautiful country of Belize. See here for a riveting post about our adventure to Mayan ruins. Here are a few final notes about our Mayan trek I feel I must leave with you. A stone’s throw from the dock where we caught the boat is a three-acre riverfront property for sale. It boasts several outbuildings, houses, and a nice looking boat dock. The asking price is $800,000. The developer of the McAfee Anti-virus software, John McAfee, is the owner and he is motivated to sell. You would be too if you were on the run from the law for the alleged murder of your Belizean neighbor. Spitting distance the other direction from the boat dock is a Belizean dichotomy, or maybe someone’s idea of an insensitive joke. A rehab center sits next door to a rum distillery. Really? Must one rub a poor abuser’s nose in the temptation of a midnight run next door for a rum and Coke? On a side note, the rehab center is in need of some major rehab itself. Remember the helpful cab driver who played our tour guide/historian? While we did the Mayan ruin tour, he apparently did a tour of the local bars and came back schnockered. On the drive back to our hotel, he drifted into on-coming traffic, passed buses with reckless abandon, and I watched him in the rearview mirror as his eyelids grew heavy and he nodded off to sleep. My husband spoke sharply to the driver and that sobered him up a bit. We made it back to the hotel safely and just in time for our own stiff drink. On another side note, if you are tempted to climb a Mayan ruin, may I suggest you enter an Olympic training program for at least one year prior to your climb? My legs were sore for days afterward making the simple process of standing up an Olympic event. 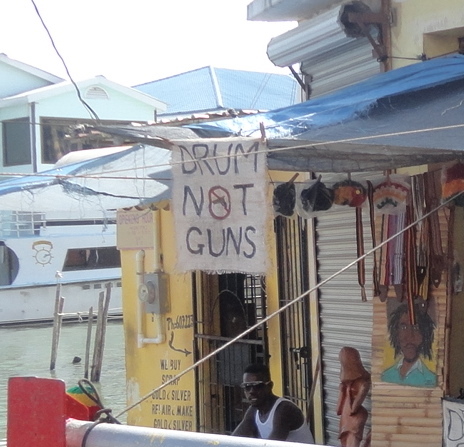 I leave you with some Belizean signs that made me chuckle. I like how Belizeans think. 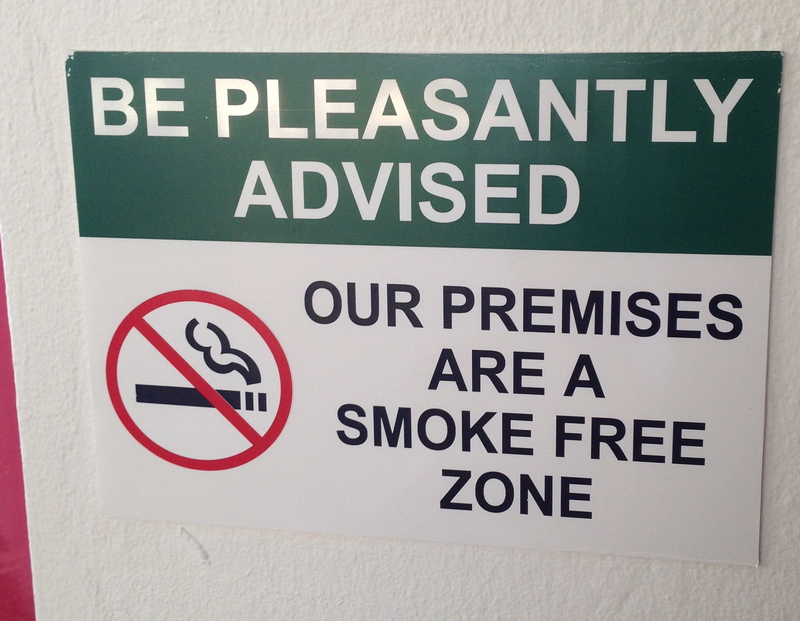 Those Belizeans are ever so polite. 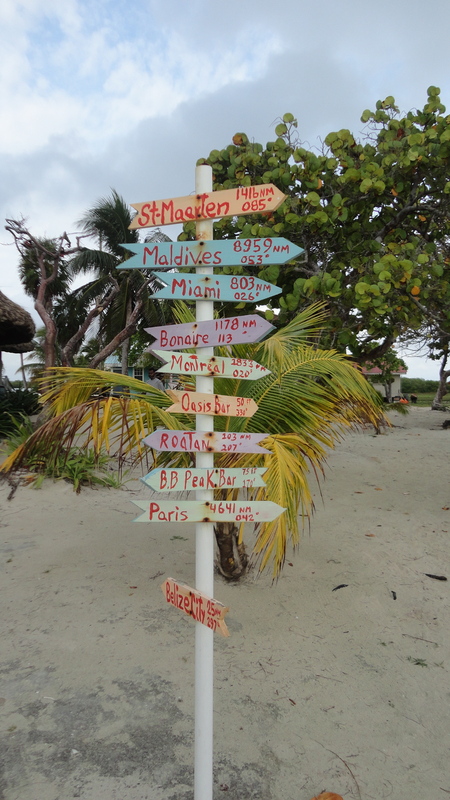 Paris is a mere 4,641 mile swim from Belize. 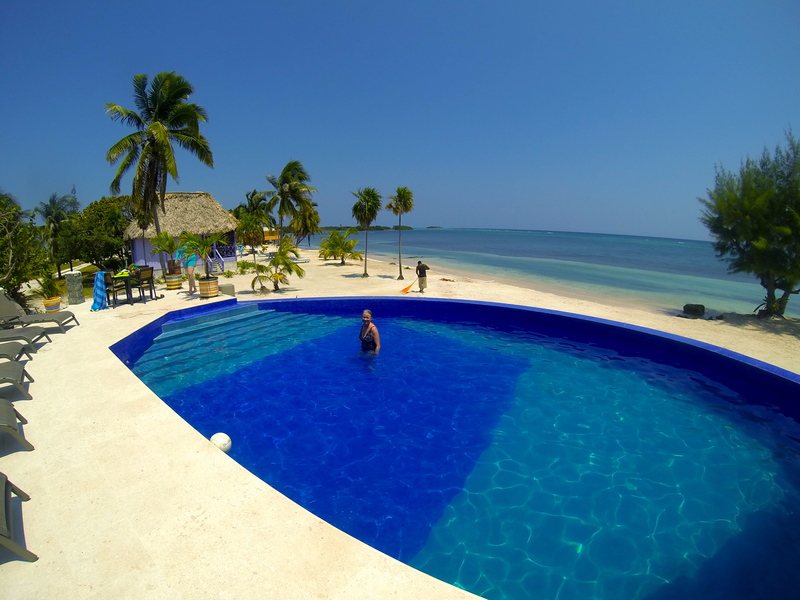 As a teaser to what is coming up next in this adventure, here is a shot of the un-Belize-able view from our island resort. The view would be a heck of a lot better if I could figure out how to Photoshop me out of it. Love those signs. 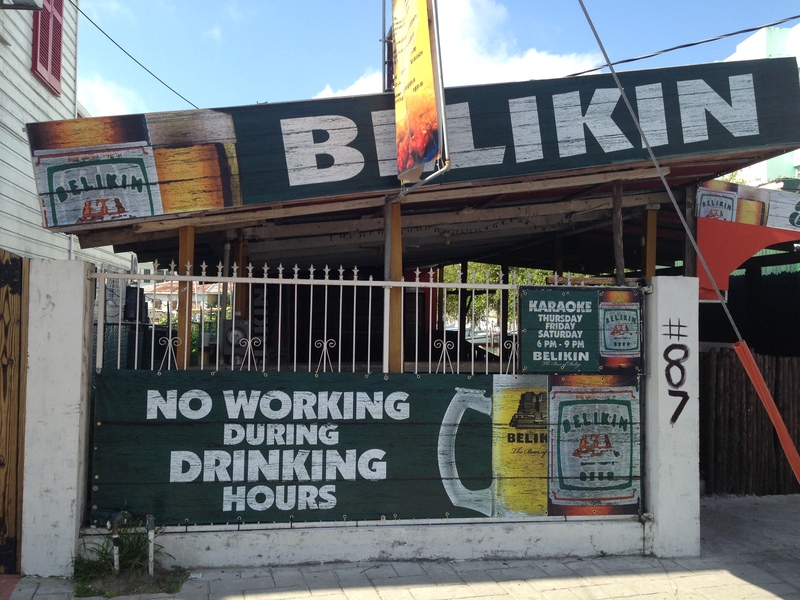 I’m in agreement about no working during drinking hours. We can’t take the fun out of everything! This will have to be my next trip! My soon to be ex in-laws continue to tell me to come back to the islands (Bahamas) since I seem a bit stressed out (no you think?). But I am thinking no, not right now. Belize seems like a good choice. How can sun and sand not be your kind of thing? It was paradise! Add a good book and a cocktail and it was heaven on earth. It’s always nice to be pleasantly advised of things rather than instructed! Beautiful resort picture at the bottom there! We couldn’t work out whether the pool is painted different shades of blue, or whether they are shadows? I believe the pool tiles were different shades of blue. However, when I study the photo, I can’t be sure. Therefore, I must go back to learn the truth for myself. 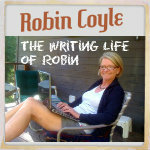 How are things at your blog? Get lots of traffic after your post yesterday? Atta girl. You are a glass-half-full kinda gal! Hilarious signs, Robin! The water looks like you photoshopped directly from Crayola’s big box of blues!!! Exactly right. Mother Nature used all her favorite blues when she designed the oceans of Belize. You have the natural, travel essay wit of Bill Bryson. I think you have found your literary calling, my friend! What a lovely compliment. Have you been drinking? My tipsy compliments are every bit as sincere as my sober ones! What? Murder is illegal in Belize? Whoda thunk it? They are funny that way. Some things are the same regardless of geography: Cabbies are highly unpredictable creatures. Your continued survival pleases me, Robin. And your snapshots are awesome, by the way! Thanks, Hook. The photos barely capture the beauty of Belize. The water is so blue it almost hurts your eyes. It is either laugh in the face of danger or cry like a baby! I usually cry like a baby. I am beginning to wish that my friend and I had chosen a resort. I will only have 8 hours in Belize City, and you have shown me such more to do! Awesome! All the more reason to go back to Belize. I’ll go with you. Near death experiences make for good stories! But seriously, my legs were soooooo sore I could barely walk up the stairs to the hotel bar. But nothing as mundane as sore muscles can come between me and a good rum drink. 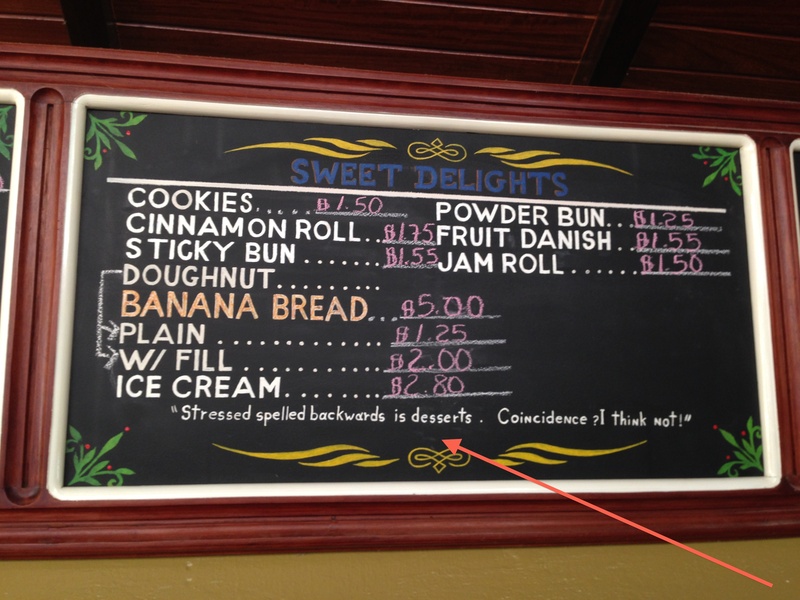 I could use some dessert…. Desserts instead of stressed would be good. Fortunately, Belize is still reasonably priced. Unlike Hawaii where a cup of coffee and a piece of toast costs $35. I hope you get there! I’m available as a travel companion . . . I’m happy to carry your bags. Wow, and it looks like you had that view all to yourself. Stunning. Aside from the staff, there were only about 25 other guests at the resort. It was our own deserted island. Breathtaking. Okay, the island is sounding good…maybe well just skip the ruins and taxi ride. Photo shop couldn’t make it any better. We had serious doubts about whether we would make it back to the hotel in one piece. My husband was close to asking the driver to pull over. We complained to the hotel who arranged for the driver and they just shrugged. I think she thought we were uptight Americans. We Americans can be so fussy.